For my next group of related films, I'm wavering between two very different threads: either spaghetti westerns, or films renowned for their cinematography. I was ready to commit to the latter group over the past week, so I saw Black Narcissus. But last night I threw in For a Few Dollars More, because I wanted something escapist, and now I'm back on the fence. I think I might have to follow both paths simultaneously. 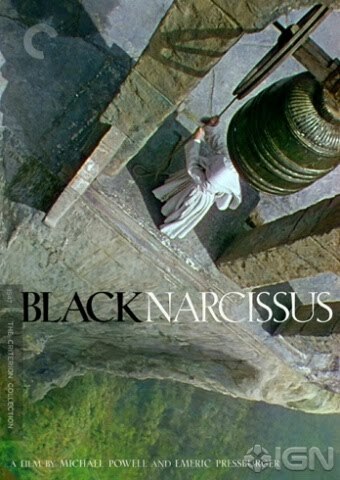 Future movie-watching aside, I feel I should address Black Narcissus. It's a film deserving of critical consideration, and I want to remember it. It's the second Archer film I've seen, after The Red Shoes (one of my favorite films of Chromatic March). 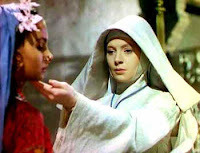 Black Narcissus is no less colorful, though its moods are very different and its tensions spring from a different part of the psyche. It won Jack Cardiff the Best Color Cinematography Oscar in 1947, and has become an essential Powell & Pressburger landmark. And how different the photography and camera-work was, back when Black Narcissus was made! Today, virtually all films -- big action films and subtle romances alike -- revel in movement and boldness of frame, swinging from picturesque landscapes to intense close-ups, and always setting medium shots in motion, following characters and panning from focus to focus. This is an age of expressive cinematography... when a character has a moment of intensity, their face fills the frame. When they're at peace, the camera takes a leisurely stroll through the garden with them. At moments of strength, we look up at them from the floor. We always seem to be chasing down the emotional cues, carrying our cameras like butterfly nets. So much of Black Narcissus was stable and calm, even at moments of anxiety and tension. Scene after scene was shot with a dedicated method of composition: the camera would establish the space, and then the characters would move through it, carefully blocked in their action, always part of their surroundings. When Sister Clodagh stands at the top of a stairway and speaks to Mr. Dean, we don't need to follow her up there, or shift between speaker and listener. We can look through Cardiff's lens and see the whole layout of the space, its walkway and its ceiling and floor, and we can appreciate how these characters relate to one another. In his essay for Criterion, Kent Jones discusses Black Narcissus' use of elevation as a motif: the constant sense that characters' interactions are structured by high and low, whether it's embodied in the status difference between Kanchi and the Young General, or in the moralistic position of the convent at the top of an inaccessible mountain. However, in addition to this, the film also employs a motif of interior and exterior, created through intensive control of color, space, foreground and background (the endless valleys depicted in the film's matte paintings). The nuns never leave the oppressive white stone of the convent, but through every window, and over every precipice, we see the green of the native lands. It's sensual, mythical, and downright dangerous, populated by mystics and hostile natives. Sister Ruth's journey into the valley to find Mr. Dean is a revealing exploration of this interior/exterior structure. She finds herself deep in the jungle, clad in a bloody red dress (madness embodied in bright red is carried over to The Red Shoes), and she finds the place she's looking for, but not the solace. This lush red and green world is a stage for her insanity, and once she descends, she becomes "native" in all the ways the film constructs them: she becomes a creature of passion and sensuality, and she discovers her hatred for the chalky white world from whence she descended. In Sister Ruth's final confrontation with Sister Clodagh, there's a flood of symbolic significances. They are on the threshold between the disciplined inside and the wild outside, occupying one of the borderlands that pervade the film: a ledge where you stand in the shadow of the convent, but where the jungle stretches all around you. This threshold has been there throughout the film, buttressed by wind, patrolled by troubled Sisters clinging desperately to their faith, the bell and the stone of their bastion of morality. And in returning to this protective shell, Sister Ruth wants to kill Sister Clodagh, but not just by stabbing her or bludgeoning her... she wants to rip her out of the convent and cast her into oblivion, returning her to the primordial surroundings to which Sister Ruth herself has succumbed. This space is both outside and below, and Sister Clodagh's fall would represent the defeat of the bastion of order by the sensual world beyond it. The problem is, the nuns cannot defeat the outside world, because that blood-red sensuality -- the flowers, the lipstick, the errant wives and dying children -- have already invaded the palace. Indeed, they've been there from the beginning. It's fitting that the nuns' only escape is to leave this uncontrollable world behind, letting the "order" they fought to create collapse into the mountain behind them.